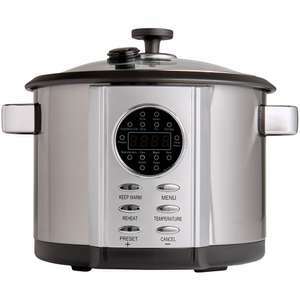 Serve up a feast with our Electric Multi Cooker. Take the hassle out of home-cooked meals with our 5 litre multi cooker that has 12 automatic cooking options. With an easy to use pre-set function, 24 hour delay timer and a 24 hour keep-warm function, it's perfect for helping you get dinner ready when you're going to be out and about. When your meal is cooked and you've served up, simply remove the cooking pot for easy cleaning. Now you're cooking! Includes 2 year guarantee. 220 - 240V ~ 50Hz 700W. Always read instructions included before use. this seems just like a rice cooker i have, anyone used this?